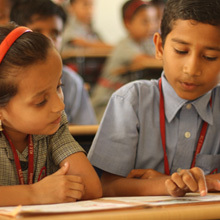 The curriculum and syllabus are in accordance with the norms of the affiliations to the CBSE. Academic evaluation of the student is done based on their performance in Formative & Summative assessments. CCE (Continuous & comprehensive evaluations) system is followed in the schools. Formative assessment includes Independent and collaborative projects to students which give them an opportunity to learn beyond the limited text books. Evaluation of such assignments is done as per the board requirements. Summative assessment is the term exam which includes the pen and paper test.